Every couple needs their own dedicated anniversary day, your very own day that will be forever yours. Having your own official day is now not just the stuff of dreams, you can have your anniversary or wedding day officially recorded in the International Day Registry. How cool is that? A certificate of ownership – which makes this a fab gift for your 1st anniversary which is traditionally paper. 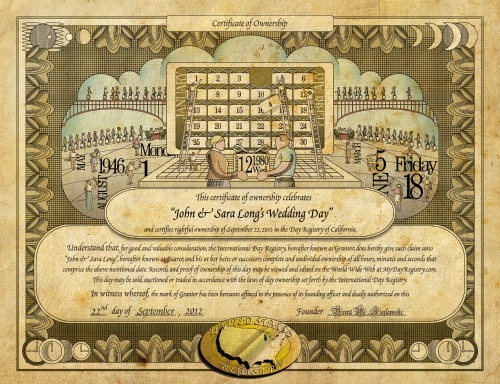 This would also make a great gift for a big anniversary, you will own your day and if you were planning on renewing your vows you could have this as your official certificate of the day. 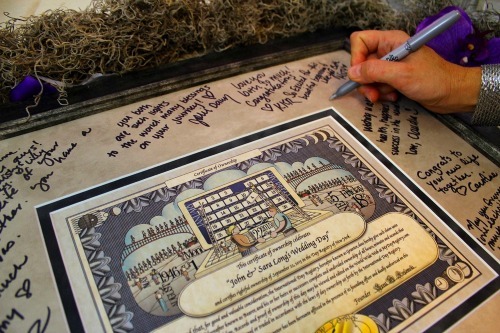 If you are celebrating with a party then you can also have your certificate of ownership used as your gift book, with all of your friends and family signing the frame. Your own day is one of the most personal and unique gifts you could give on an anniversary and you wouldn’t want anyone else having your day, would you?